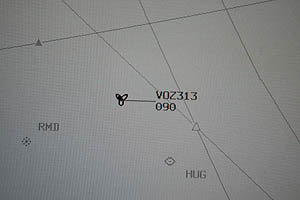 A Class 2 ADS-B track symbol showing a Virgin Australia flight at 9,000 feet on the TAAATS. The Australian Advanced Air Traffic System (TAAATS) is one of the most advanced, integrated air traffic management systems in the world and provides terminal, en route and oceanic air traffic services over most of Australia’s 56 million square kilometres of airspace. Only about five per cent of Australia’s total airspace is covered by radar. Where radar is not available, the aircraft position information is derived from other sources, including Automatic Dependent Surveillance Contract (ADS-C), current flight plan data, pilot position reports and , Automatic Dependent Surveillance Broadcast (ADS-B). The shape of the position, or ‘track symbol’ on the TAAATS display screen is an indication to the controller of the source of information being used to track the flight. If position information is being received from more than one source, TAAATS displays aircraft position in the following priority order. Relevant flight information is linked to the track symbol in the form of a data block, or “track label.” Label data can include flight identification, wake turbulence category, altitude information, ground speed, destination and aircraft type. TAAATS has been upgraded to process as many as 1,000 ADS-B flights simultaneously from up to 200 ground stations. It also now uses ADS-B technology to provide air traffic controllers with automated safety alerting capabilities and continually monitors the assigned route and altitude of ADS-B approved aircraft for any discrepancies.